In yoga we practice balancing postures, such as tree pose and triangle. In each of the balancing poses we need to focus our eye’s attention to one spot on the wall, connect our feet to the floor with intention, and most importantly remember to keep breathing. We can learn from these poses by recognizing the importance of finding balance in our everyday lives. Do you ever drive home from work, pull in the driveway and question how you just there? Not being fully present throughout our days can lead to feeling scattered and distant. Being present with the task at hand and focusing our complete attention to that moment can help us to feel centered and balanced. We all wear multiple hats and take on different roles throughout the day. It is inevitable that somedays one of the roles is going to get more attention than another. When these days start to add up, we need to take a step back and determine where we can find our personal balance. How do you find a balance in your life? Do you find yourself stuck wearing one hat too often and not being able to give the others a little more attention? Sometimes we have to put a little more time and attention into ourselves to find that state of balance. When we step away from our daily tasks and find some time to focus our energy on self care, we often find that our many responsibilities and tasks get a little easier and flow a bit more smoothly. There are a number of ways to hit your personal reset button. Get a massage! Massage is a great way to move any stagnant energy we carry in our bodies, gets the blood flowing, and allows for complete relaxation. Massage continues to grow in popularity as it compliments medical treatments and provides whole being benefits. Receiving a Reiki treatment is another way to find complete relaxation and relieve the body and mind of tension and stress. Reiki is an ancient technique origination in Japan used for deep relaxation, stress relief, and overall healing to the mind, body and spirit. A structured yoga class gets you to a serene environment without distractions and you can take an hour to move and stretch your body all while connecting to your life force - deep, oxygenating breathes. It’s on the yoga mat where you can practice the postures and create a sense of balance within the body that will go with you after class and into your daily life. ing like you are floating on air from all the good vibrations. 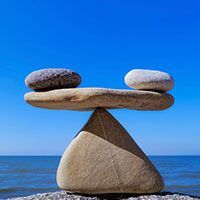 Life is about finding a balance in all we do: time for ourselves, time and attention for others, family, friends, work, recreation, food, exercise, and everything else that crosses our paths. Open your eyes to the many options of helping you find your reset button...explore and connect with the ones that work for you and make them a regular occurrence for a well balanced life. Balance on Buffalo which exists as an oasis...providing a safe and nurturing space in which to manifest and empower your own innate capacity to heal. Massage therapy and bodywork, sound massage, Reiki, coupled with our ongoing yoga classes, kirtan and special workshops are all intended to spark an unfolding of the beauty and human potential that each of us carry within. We are here to guide and nurture a greater awareness and unification of Mind, Body, Heart and Spirit by exploring the space that divides them.